San Juan del Sur is getting it’s very own BIGGEST LOSER competition! The competition is sponsored by the Buena Vida Fitness Centre and as of today there are already 12 contestants signed up. First weigh-in will be held on Monday Feb 1. The contest will end on Friday March 26 and prizes will be awarded for those with the largest weight loss. Each contestant will receive fitness and nutritional guidance; and is encouraged to take advantage of daily training sessions at the Buena Vida Fitness Centre included in the competition fees. Contestants will weigh-in weekly and progress (expressed in percentage of weight lost) will be posted at the Fitness Centre and submitted for publication in the del Sur weekly newsletter. 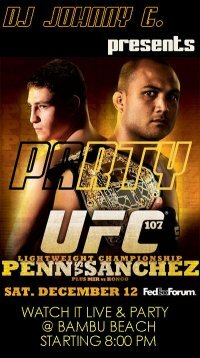 DJ Johnny G. is throwing a party tonight for the live coverage of: UFC (Ultimate Fighting Championship) 107 Penn vs Sanchez. Party in the sand with DJ Johnny G. and a guest DJ at the turntables. FREE shots of rum with your dinner order. The next context is in two weeks in Astillero. San Juan hosted another fantastic volleyball exhibition game last Friday, May 8th. This time the Nicaraguan National Women’s team was victorious against the University of West Florida Women’s team. The game was held at the Sports Park and was great Friday night entertainment to a good crowd of sports fans.